Concept: Mute monk with a keen perceptive eye and a past of which he never "speaks"
Appearance It has been said by some folk far wiser than Ashton that "Clothes make the halfling" and they're most certainly right - but Ashton's take on it is that the clothes make the halfling noticed, and, while for some that may be ideal, that's most certainly not something that he wants to be. His appearance is inextricably linked to that fact. People are in any case going to think of him as odd and different and perhaps not all there because he does not speak, and that's fine with him - and he indulges that impression, doing his best to be unremarkable and unassuming. It's practical, given that he has never had much money to spend on clothing anyway, but more than that, he wants people to forget he was ever there... even forget he's there in the moment, so that he can watch them and learn from them and pick up clues as he does. You'd be amazed what things people - humans and other longshanks in particular, but anyone - let slip when there's a halfling around and they don't really focus on who might be listening in. Add to that a mute halfling who has perfected the art of the vacant stare and the situation is tailor-made for information gathering. He buys the best-made clothing he can, preferring quality materials that will hold up, but they're all drab grays and blanks and if he's feeling particularly festive or venturing outside the city walls, perhaps browns and grays - not so much camouflage as simply background, whatever colors make him blend into the setting metaphorically if not literally. Ashton typically carries a brace of daggers with him so that he might have one in his hand while having a second and third easily for throwing or if someone disarms him. Stick a fourth in a boot in case it comes in handy, and it's not just his observations that tend towards the pointed. If his hood is down and sometime bothers to take a closer look at him, he's relatively attractive though, again, nothing particularly to write home about. Curly brown hair, slate grey eyes and average features; it's really only the spark of intellect in his eyes when he's paying attention that would catch someone's attention and make him intriguing or attractive. He's relatively average height and weight and moves with a quick and distinctive grace that's part natural and part hard-won through his training. His hand gestures are precise and clear since he has practiced them routinely and often relies on them to get his message across to people he doesn't know, either not wanting to spook them with the Silent Speech or not wanting to show his hand by "talking" with them. Personality Ashton's public persona would lead one to think that's he's a dullard, no fun and not even much spark of life. It's all an act. He doesn't speak and that's an obvious enough point, but that's what he does, not who he is, and as noted above, it's very much calculated and he hopes it will give him an edge at his job. But in private, with friends, he's jovial and fun to be around - never the life of the party, since it's hard to really control a room when you only "talk" to one person at a time and aren't up front leading a song or telling a rousing joke to make everyone laugh - but he's quick-witted and funny, interesting and introspective. His muteness makes it hard for that to come across sometimes but it's there, and those characteristics are in many ways the flipside to his at-work person, where he watches and observes and reads people, and he puts those skills to use in social settings, too, whether as a negotiator or someone who is able to crack just the right sarcastic comment at just the right time (albeit only to a single person, who often finds him- or herself repeating the joke aloud for the others). Ashton is dedicated to his job and finds investigative work fascinating. For a boy from a small near-nomadic clan that traveled what was basically the wilds, Bard's Gate is all he could want, a font of endless people to watch and a crucible on which to hone his skills and better his lot in life, all while doing some small things to atone for what happened in his past. He works hard, rarely complaining, and pushes himself to excel, not so much out of a perfectionist streak as because he truly finds it fun and interesting and something he wants to continue to pursue as a career - which means doing the job well, as best as he possibly can, so that he will succeed and advance. When he's not working, he prefers smaller groups since they're easier for him to communicate with and feel like a part of, but oddly he's not particularly comfortable just on his own. He likes to socialize and be around others and feels (for reasons both practical and personal) that he functions better as a member of a team than as some sort of lone wolf viligante. Childhood and the Shaman's Words Some are born folk heroes. Some have folk hero thrust upon them. Others are called “folk hero” by many but know that’s not the case. Not all, most distinctly not! Ashton Ashguard falls squarely in the latter category. 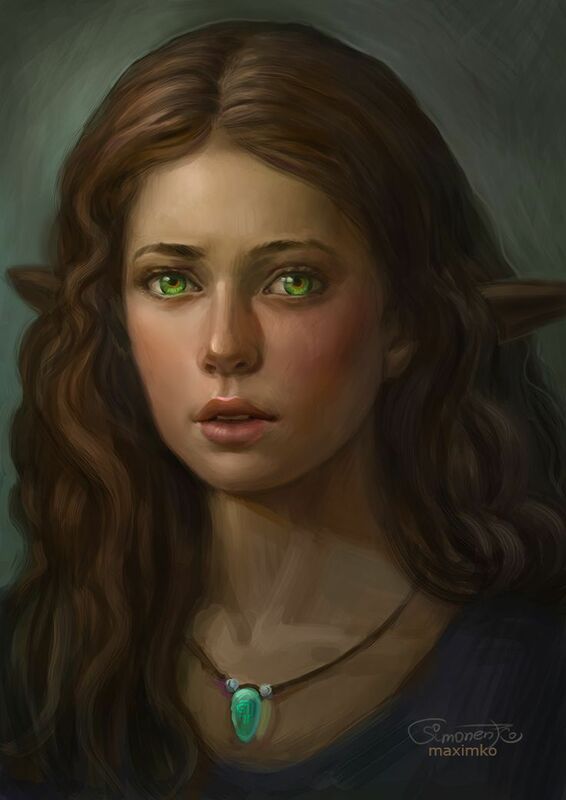 Now, Dar’Nielle was known to be an unreliable seer at best. She was congenial, well-liked and made quite an effective poultice from peat moss and her special “healing mud” as she liked to call it, and her festive bread, on the rare occasions she was able to bake it, was the toast of the ghostwise. But a prophet? It is perhaps fitting that the first lines spoke of “wanting prophecy” for her own rate of success with portents, be they dire or welcome, ranked somewhere between “lacking” and “wanting”. Here, though, there was something in her tone that burned the words into the mind of Ashton’s mother, Rowenna, even in the midst of her birth pangs, and when she repeated them to the growing boy, it was in tones most solemn, and so young Ashton always watched out for bloody rags, heretics, and odd rumblings coming from the direction of the setting sun. Time passed and the rags were all clean; windows more or less non-existent as Ashton’s people broke camp and moved most nights and the windows in the towns they did visit more likely covered by shutters or animal skins than anything washable; there were no floods on the fertile plains and prairies around Bard’s Gate. Ashton’s family and fellows hunted, fished and loved and laughed until a year or so ago, when Ashton and three others were returning from a rabbit-trapping foray when they heard an earth-shattering roar and saw a fire from the heavens flare down towards their camp. Smoke, filling the forest as Ashton and his friends ran down the path. Flames, licking up and over and all around the tribe’s tents. Screams, not Ashton’s but his family’s. His friends’. He ran on. His sister, mother, father were all in there, amidst the flames. He leapt over a small, odd stone, blazing hot and surrounded by already burnt grass, pulling whoever he could reach from the tongues of fire and burning tents. Shrieks were all around him, but Ashton said nothing, just ran and pulled and leapt and jumped and it was all a blur, a smoky nightmare of death and ash. When the smoke cleared, the tents were gone, burned to a cinder – but only one clan member had died, an elderly halfling woman from the looks of it, but it was not until Dar’Nielle was nowhere to be found that it was clear just who it was. Ashton, meanwhile, was lauded as a hero for saving no fewer than ten others, despite suffering significant burns to his hands in doing so. But he shied from the attention instantly, disclaiming any sort of heroism or accolades – because he knew, just knew, deep inside, that this was all his doing. He had been warned, nearly two decades ago, and he had not listened. More to the point: he had spoken, just as the milk had flooded the village and his mother told him not to. Dar’Nielle’s death only drove home the point. This fire was his doing, it had been foretold, and he had ignored the warnings and now his clan was destitute and their shaman dead. But the approbation continued and still he remained silent, for a day, then two then a full week, and even as others implored him to own what he had done (meaning, to them, the lives that he had saved, of course), with talk murmuring even of his taking the mantle of shaman or perhaps leader of the hunt, he could take it no longer. This was his fault. He was no hero and certainly no leader – gods no, not when the merest sound of his voice at the wrong moment had brought fire from the skies. Beggar’s Guildhall, which he had heard offered training in the arts martial and ways of silent contemplated. So he trained and remained silent and reflected and contemplated and learned. He came to realize a few things that set him on his current path: that whatever this prophecy was – if it even was one – he needed to do something other than wallow in unspeaking self-pity; that perhaps he could avoid calamity by remaining silent and that he had a keen eye for observation and, of course, the Gift, so that he could communicate with others what he saw, even if it was awkward and occasionally off-putting communication. So he made his way to the agency, hoping to put his talents for investigation to good use, to do some actual good in the world and so atone for his error in daring to buck the prophecy. His initial appearance caused a bit of a stir, since he remained silent and only used the Gift to speak to a single person at a time. But the others came to quickly realize that his silence could serve a purpose, too, by permitting him to fall out of the attention of their subjects and so observe almost unnoticed and pass along what he saw. Moreover, he was a kind and generous soul and quickly made the acquaintance, in his odd and inherently slightly-standoffish way, with the other newer members of the company and in fact became fast friends with certain of them. The city appealed to him, he came to realize; it could not be more different than where he was raised but it has a life, a murmur, almost a heartbeat all its own and he loves nothing more than to people watch. Not people watch for the sake of work, but just to purchase a roll or a skin of wine and perch somewhere off to the side of a busy market square or even atop a low-slung home and watch the world go by. His growing martial skills, notably with the dagger he carries at his belt and never – not even with the Gift – speaks of, made him a valuable member of an investigative squadron as well, and so it was that when the call came to journey to Lornedain, his name was among those selected. Questions of Great Import 1. Include 5 background and concept elements that you feel are important to your image of the character. These can be a concept overview, a list of important life events, a physical description, a personality profile...whatever you need to get an image in your mind. 5 is just a minimum...more elements are encouraged! He doesn't speak. That could hardly be move obvious, but it's listed here to be clear. His parents and sister are still alive and still scraping together a living as they always have. It tears at him that he left when he did - as they were left with literally the clothes on their backs and very little more - but he just could not stomach it. Could not take the "hero" this and "savior" that, all while knowing the "truth" (as he views it)... so he left, but he knows that his family may well have suffered as a result and he sends coins to them when he can, if he's able to - that is why he has so few possessions. Finding someone who is heading to the ghostwise is not always the easiest thing, but he is looking for someone who will carry a message for him before he leaves for the Barony. As noted above, silent does not mean dour or somber. The events of that dire day weigh heavily on him, to be sure, but he does realize that life goes on, and even in his short investigative career, he has seen more than his fair share of death and so he pushes forward, his work a combination of a quest for excellence, an attempt for some sort of karmic atonement and a source of mental reassurance. He doesn't much like to punch. Kicking, yes - and a well-trained kick on the shins can be quite painful - but for combat with his hands, he prefers his daggers. Owls amaze him. He wishes he could own one of his own and in the meantime takes inspiration from their silent grace and lethal swiftness. 2. List at least two goals for the character. At least one of these goals should be one that the character has, while another should be one that you, as a player, want to see developed over the course of the game. One goal is more a vow than a specific goal: stay silent. He has to - he's worried that the prophecy is still in place and portends something more dire should he speak again. A far more distant goal, one that is best termed a "hope, is to understand the meaning behind the prophecy and maybe somehow get assurance that it has been fulfilled or discharged, not so much because he would simply start to speak again if he knew he could, but as a mix of atonement and reassurance that he would cause no harm. In the meantime, he strives to excel at his chosen occupation as an investigator. He knows that he has certain talens that position him to advance and potentially achieve great things but others that are a significant drawback. He is going to work hard, take the role seriously and prove to everyone that maybe he is a hero but it's earned and deserved this time. 3. List at least two secrets about your character. One is a secret the character knows, one is a secret that involves him but that he is not actually aware of yet. This will help me in creating plots that center around your character. His entire past is a secret to everyone in his current life. The event was not so dramatic as to garner attention outside his clan and the few small communities very near where the fire broke out, and he has not shared it with anyone since arriving in Bard's Gate. For that matter, the reason why he does not speak is a secret, too, and he has never told anyone why - avoiding not just the events that triggered it and the odd and completely troubling folk hero status that came with it but the prophecy and everything else. The Gift itself is almost a secret, in that not many folk have encountered ghostwise halflings in Bard's Gate, so when the silent halfling suddenly asks a silent question, more than one person has literally jumped at the fact. So he uses it sparingly, too. He found the metal that would become the blade of one of his daggers in the forest near the fire site, too. It cost Ashton a pretty penny to have the shard turned into a knife and it's his clear favorite. He has never known its origin - so that is a secret, too. The player knows, though, that the dagger has origins far from Bard's Gate, though not specifically wherefrom or how it managed to be found there, close to the impact point of the fiery ferrous-rock. 4. Describe at least three people that are tied to the character. Two of them are friendly to the character, one is hostile. If you like, you can include an enemy of yours here as well, so I have an instant NPC nemesis to throw at you. Naliala Shaetress: Naliala is Ashton's close friend and fellow investigator. The two were drawn to each other almost immediately when they first met over a mug of ale, and they have done everything that they can to work together ever since. The tall half-elf is a mage of no inconsiderable promise, though she is early in her training just as Ashton is. 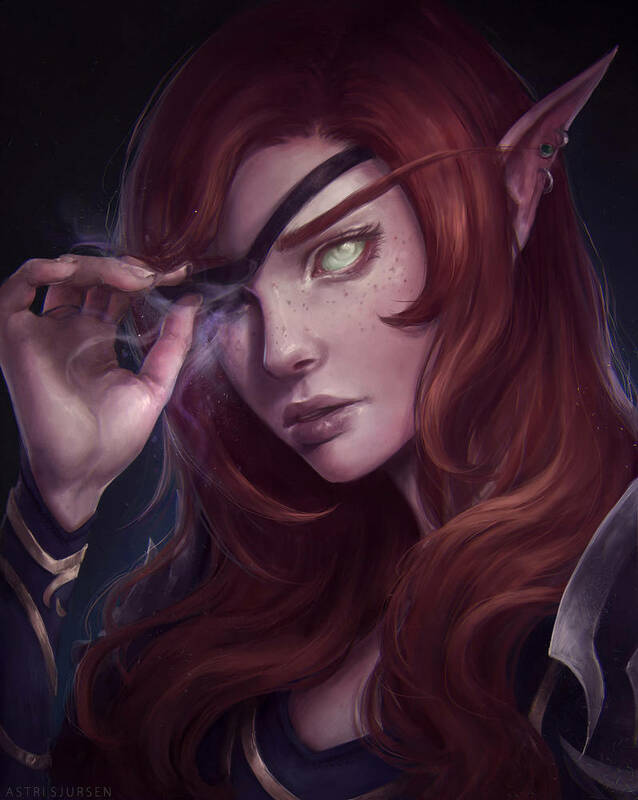 She wears an eye patch as the result of an accident with an errant torch as a youngster, and her other eye turned cloudy in the accident - it, however, functions perfectly and perhaps even more acutely than normal ever since. She is talkative, charming and good-natured, and she and Ashton quickly realized just how complementary their skill sets are - he of the ever-searching eye and endless observation, ready to guard her blind side, and she possessed of a way with words that he never had even when he did speak and a magical power he still finds endlessly fascinating. She drinks as hard as he does and claims she can out-eat and out-smoke him though they have not yet had true occasion to put that to the test. She claims, too, to be fleeter afoot than Ashton - which is probably true and certainly should be given that she's near twice as tall, but of late he is catching up. To be named later, depending on which would fit the neighborhood! tavern beneath the rented rooms that Ashton and Naliala, one next to another, use as their homebase, Barnacus is almost a third member of their triumvirate, always quick with a joke and quicker with two mugs (and perhaps a third, for him) when they return from a long day or night in the field, he plays an important role in keeping "team" morale high and a ready ear open for gossip - which has helped the pair more than once. Exactly where Barnacus came from is not clear, since he would prefer not to talk about it, though no one gets the sense he is hiding anything notable or trying to be mysterious. It's more that he prefers to live in the moment and, though he did not come from Bard's Gate, he lives there now and has for "damn near a century" as he puts it, and that suffices for him. He has a daughter who occasionally works as a barmaid in the tavern, too, in between time spent studying for some career that Barnacus - though ever the proud father - never quite eludicates. 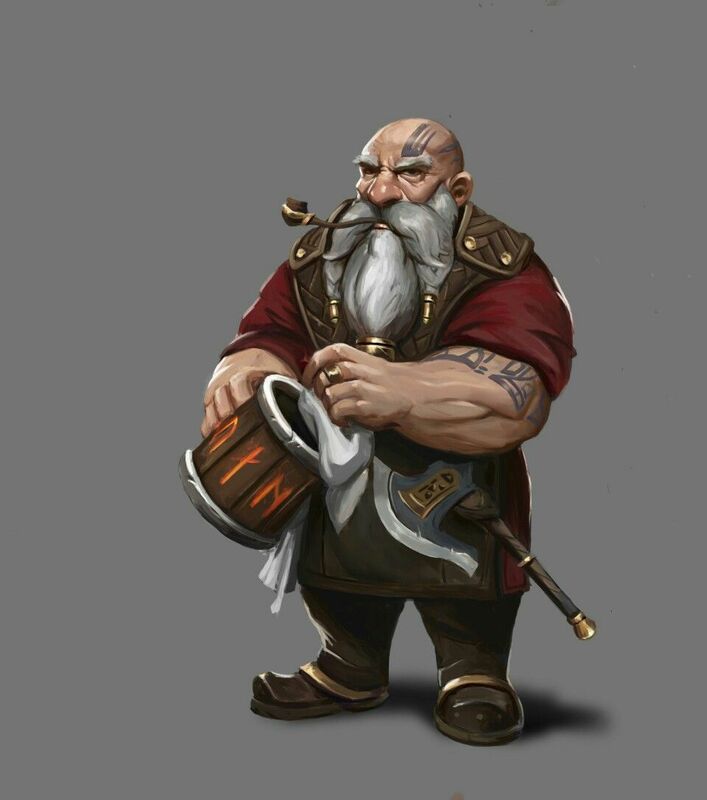 His wife works a small market stall that largely sells textiles but occasionally and unexpectedly sells some sort of dwarven trinket of great craftsmanship that surely came from the dwarven homes far away. Polymyra Swifthearth: Polymyra works at the Beggar's Guildhall in what passes for an administrative role in an organization that is quite loose-knit and not particularly guild-like. But someone needs to help keep things organized and make sure that would be monks and ascetics - not particularly known for their ability to think long-term or practically - are fed and have clean if spartan chambers in which to sleep. Polymyra herself is a skilled combatant, a monk who has taught Ashton a few tricks of the trade, even though of late she would call herself retired from the trade and more focused on her current work. She and Ashton are friends and she is something of a mentor, though not so much in the sense of a teacher of the martial arts as a guide to life in Bard's Gate. She introduced him to the investigative agency and pulled a few strings to help him procure his lodgings when he joined, and he turns to her for advice on most all matters that have to do with the practicalities of life in the big city or, frankly, life generally. Dar'Nielle: Dar'Nielle was the shaman for Ashton's clan from and well before the day he was born, up until that fateful day of the fire. Born to the clan night two centuries before Ashton was, she lived a long and fruitful life as the clan's healer, wise woman, midwife and general dispenser of advice and medicine. Prophecy was not at all her calling - she had uttered one or two before the words she spoke on Ashton's birth but none were either major or particularly proven true, which made what she said to Ashton all that much odder, and potentially frightening. But her ghost has been seen more than once, a younger if spectral incarnation of Dar'Nielle, following the clan through fields and forests. She's not menacing, just utterly mysterious. No one knows why she's here, what she wants or why her soul won't rest - and then there's the matter of the chains that appear to bind her wrists and ankles. 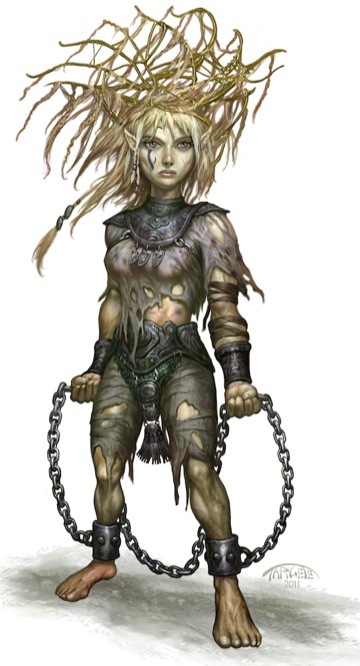 If undeath brought with it some sort of anti-aging mechanism, it has not otherwise treated Dar'Nielle very well. 5. Describe three memories, mannerisms, or quirks that your character has. They don't have to be elaborate, but they should provide some context and flavor. Ashton is mute. That has been well-described above and is such a central part of who he is that it probably doesn't merit being called a "quirk" - it's just who he is. He fancies himself an owl, not that he has much direct experience with them other than from random encounters in the forests and plains. But he calls his daggers his "claws" and aims to strike and move and strike again, much as would the owl at night. Not being able to see in the dark hampers this, of course, and he really wishes he had the gift of the elves or dwarves in that respect. Ashton is not much of a jokester, but the Gift does make him smile on occasion. He's empirically terrible at copying voices unless he has been able to study or really concentrates on it, but when he doesn't and is in his cups or otherwise feeling like a joke, using the Gift to talk in an absurd voice directly to an unsuspecting someone - who, of course, is the only one who can hear the voice - makes him laugh every time. Whenever he plays dice, which is as often as he can, he only rolls by flicking the dice with the tip of his left-hand dagger. He is a terrible card player. For all his prowess at remaining silent and diligent, unnoticed observation, his face when playing cards is an instant tell and his skill certainly is not enough to make up for it. Coffee? Yes, please - and once upon a time, in copious amounts, though it makes him jittery lately and he can't sleep worth a damn if he drinks it after high sun, so he's trying to cut back. Beer? Dark as it can be. Food? The spices of Bard's Gate amaze and entice him, the hotter, more complex and more pronounced the better. He cannot believe he lived as long as he did with too much caffeine in his bloodstream and a lack of real spice in his life. Ashton sneezes, a lot. Through hard work and monastic training, he has come to learn how to control it when it really matters, but get him in a dusty room and he'll commence a flurry of sneezes. Last edited by RobMatthys; Today at 3:41am. @bwatford - Ashton's application is complete and ready for review. Can you please mark it that way when you get a chance? I welcome all comments and critiques. As always, thanks for your consideration!